I know this isn't really Stampin'Up inspired except that I made the little box using the wonderful foiled designer paper. I knew the foiled paper would make good boxes as the paper is actually quite heavy weight card, its a dark kraft card colour in-between the foiled patterns. 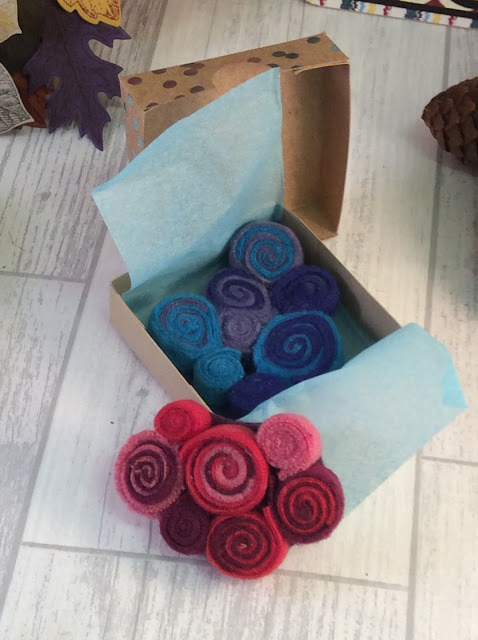 The brooch itself is made from little pieces of rolled felt. I have made two one in pinks and one in blues. I have made the box for the one in blues with the blue foiled spots, they really twinkle, and it looks great....ready to gift. Looking forward to running this class with children during the half term break. 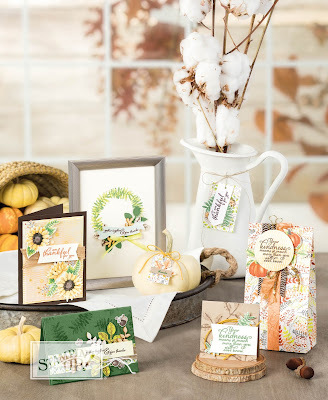 Tomorrow is the start of October and Stampin'Up have a special deal for the whole month. Now I know we all love a bargain but this is one of my favourites. Yea we have all been there I hear you cry. 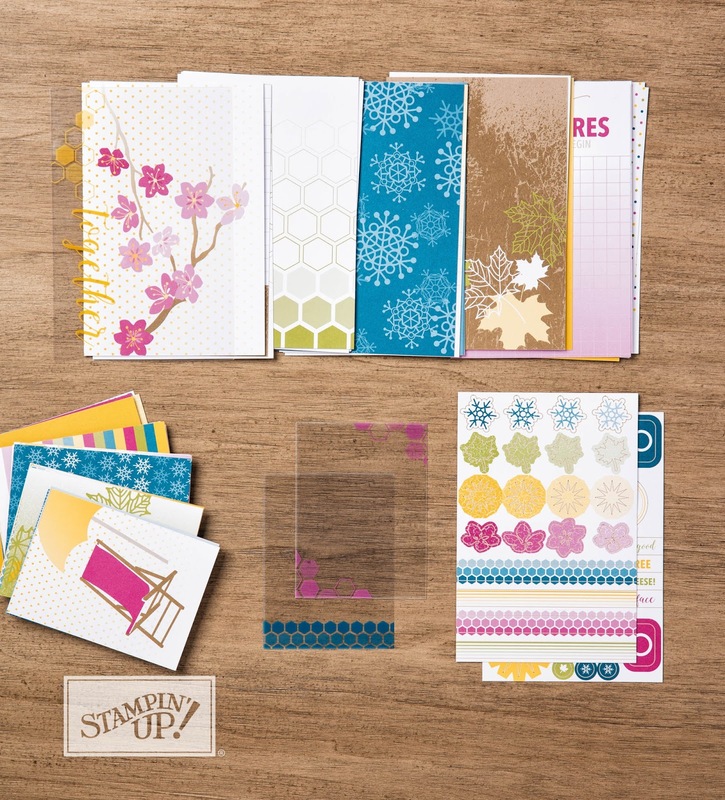 For the whole month of October Stampin'Up are offering free paper. YES FREE PAPER. For every one who places an order in my online shop of over £35 during October, I will send you half a pack of designer paper. 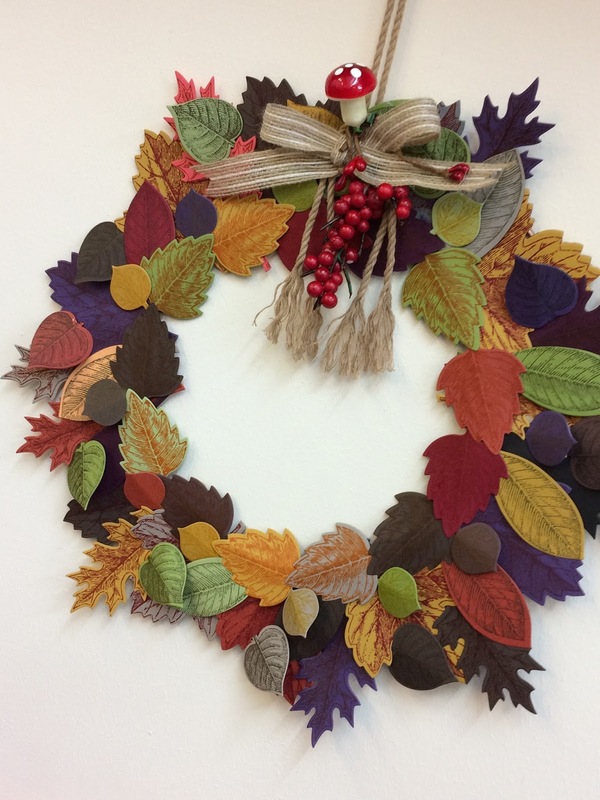 you will be able to choose Christmas or Non Christmas during the first week of November. So the first paper was a christmas one, this last paper is a christmas one. This paper will feature in this years star book. I have called it the 'Nutcracker' christmas star book. More details about this later but just to let you know the workshop for the star book will be on November 30th. the matching stamp set is sat on my desk ready to be used on Monday. Please come back tomorrow to check out the papers with their shop links and a special offer from me. Today I have been creating samples for my children's workshops. I have posted pictures of this first project on my instagram account and facebook and had lots of messages from people who thought they would like to make one. For the children I will do lots of die cutting so they can stamp some or all of the leaves with the corresponding stamp. The older children will be able to die cut some of the leaves if they wish. 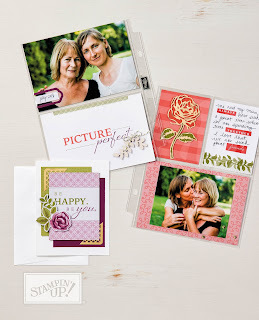 I am thinking of adding an adult class where you do your own die cutting.... I do have 3 big shot machines or you can bring your own. We could improve the bow and trailing berries part and add bunting across the centre. If you would be interested let me know. This is a great way of using up scraps of card. Shopping online is easy. Click on the number next to the item you are interested in and you will go directly to that item in the online shop. Use the hostess number below then in October I will send you some Christmas Stampin'Up goodies. 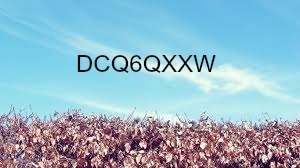 Only 2 days left with this hostess code. Day 6 penultimate day of paper. 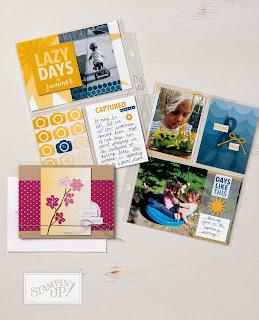 The day after tomorrow is the start of October and Stampin'Up have a special deal for the whole month. This set is a stunner. 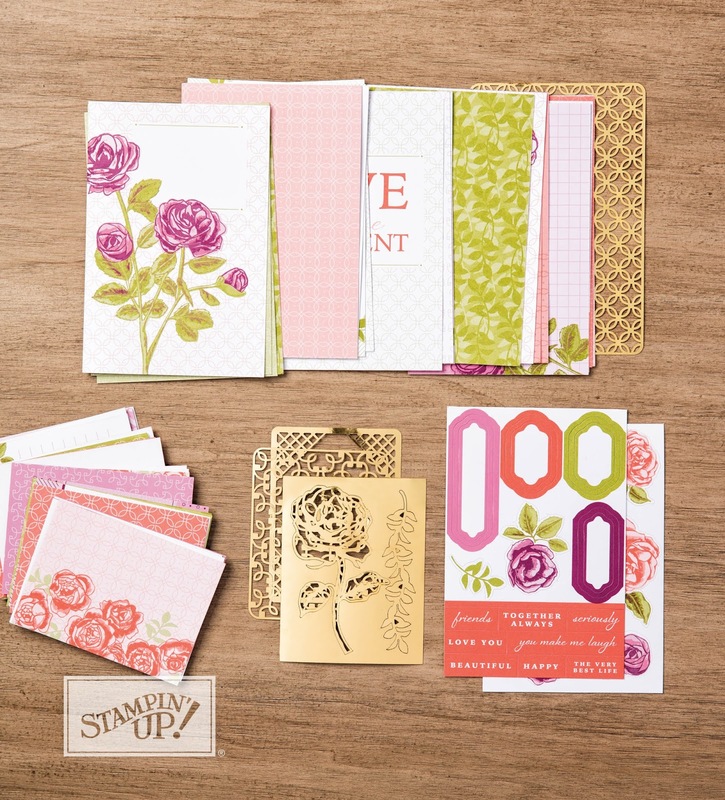 Next Sunday is the start of October and Stampin'Up have a special deal for the whole month. 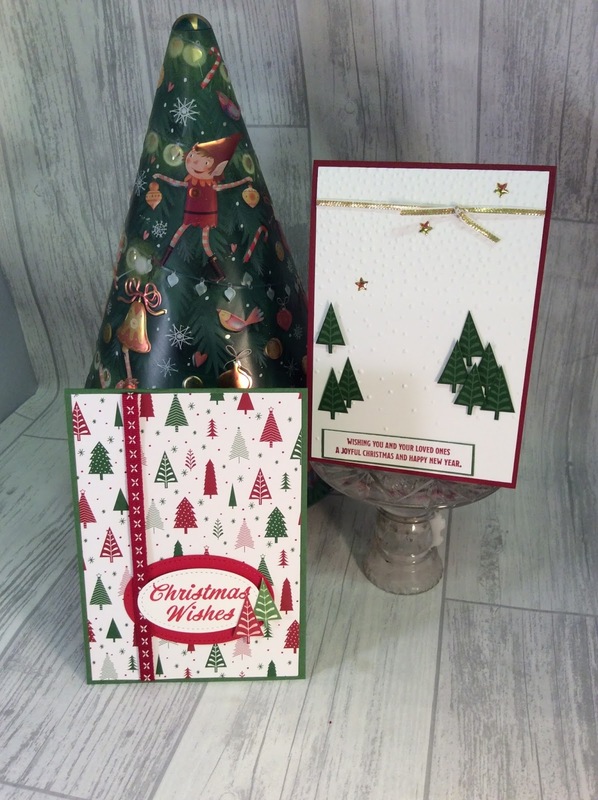 Today I have two papers that make great cards, box lids and everything else for children plus the forever young adults of course! Birthday memories and Pick a pattern. I do admit when I first saw these the Birthday memories created so many ideas in my head it was fit to burst. The Pick a pattern did nothing for my. However for my friend.... she had the exact opposite re action. Thats brilliant, we have very different tastes but Stampin'Up pleases us all Happy Dance. The stamp set matches the characters printed on the sheets. So you can create a brilliant co-ordinated look. Second Pick a Pattern, my friends favourite.. The little dinosaurs and so cute and I do love the mushrooms. What do you think? How would you use this set? This first pack is called 'Petal Garden'. and as you can tell by the name it is quite floral, with pretty pinks and peach colours. 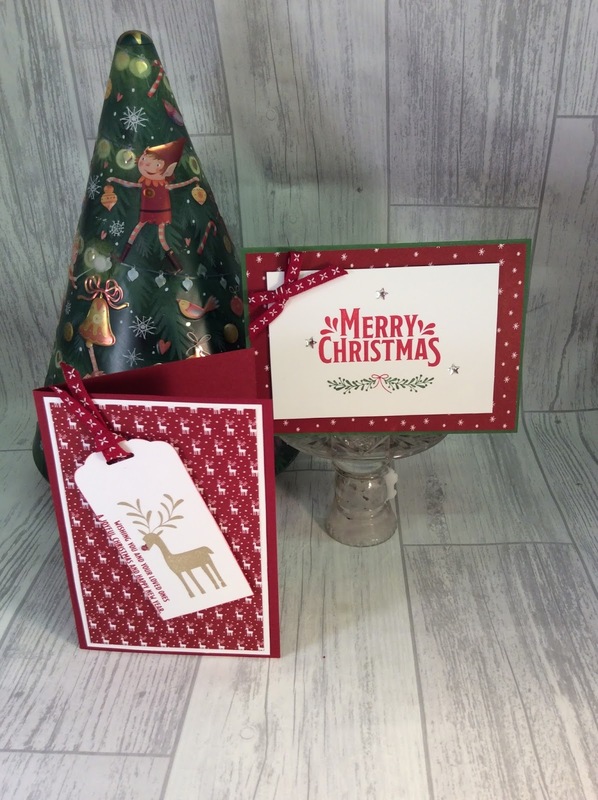 The memories and more card packs contain 72 double sided cards, in two sizes, a sticker sheet and some gold foil die cuts. 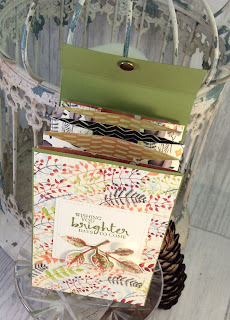 The second one is called 'Colour Theory' This one is a must, it covers every season of the year, the matching stamp set and dies are wonderful. More on this set another time. 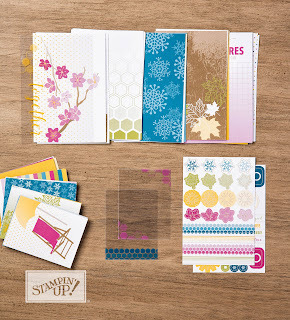 These are great background papers, check out page 147 of the annual catalogue for the stamp set and dies. If you need a catalogue message me here The memories and more sets are £9 the cards are ideal for crating card fronts, but I love my albums of photographs enhanced with these cards. Check out pages 190 - 193 for the memories and more albums and photo pocket pages. All the papers will be listed together next sunday so that you can get that order in. I saw this on Anne's Happy Stamper you tube but I can't find it again. Luckily I took not of the measurements as I watched the video so was able to make this afternoon. It fits together brilliantly. So tonight I have been shopping for things to fill it with. Since taking the pictures I have made a lovely bookmark style card to go in the first pocket then I have those individually wrapped Biscoti biscuits and some envelope wrapped fruit tea bags. I love it and thinkI will make a couple for my next craft fair, they would be wonderful gift card holders. 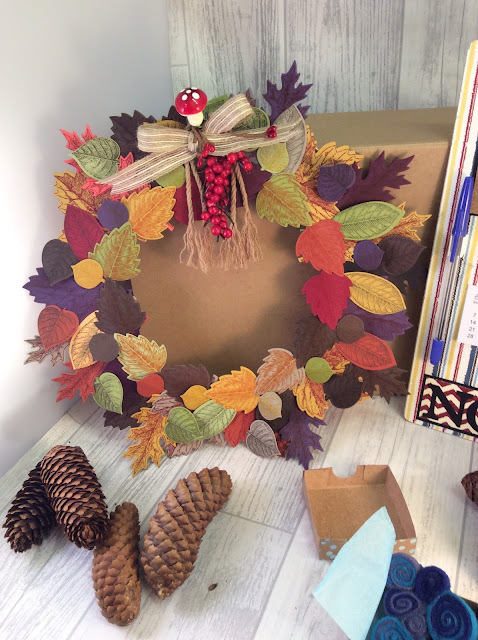 We will be making this on Saturday along with the home decor plaque and a surprise item. A little clue.... the surprise item involves......a chocolate orange! Isn't that a lovely little box. For every one who places an order in my online shop of over £35 during October, I will send you half a pack of designer paper. The first paper for today if the 'Coffee Break'. I love this but it is still on my - to buy - list! I love the stamp set that matches too. I plan on using this in March/April next year for my project class. The colours are fresh and clean and coffee and chat is a favourite pass time. This is certainly top of my shopping list whilst this special offer is on. The second paper for today is all about colouring. 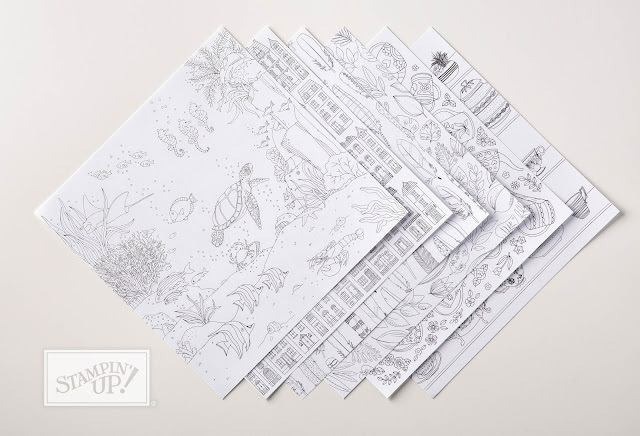 There are 6 designs, 2 of each and the paper is blank on the reverse. The colouring papers in the SAB brochure earlier in the year were very popular and I only have two packs left in my parcel in the post (view in tab above) This would make a wonderful Christmas present along with a pack of the Stampin'Up watercolour pencils. Shopping online is easy. Click on the number next to the item you are interested in and you will go directly to that item in the online shop. 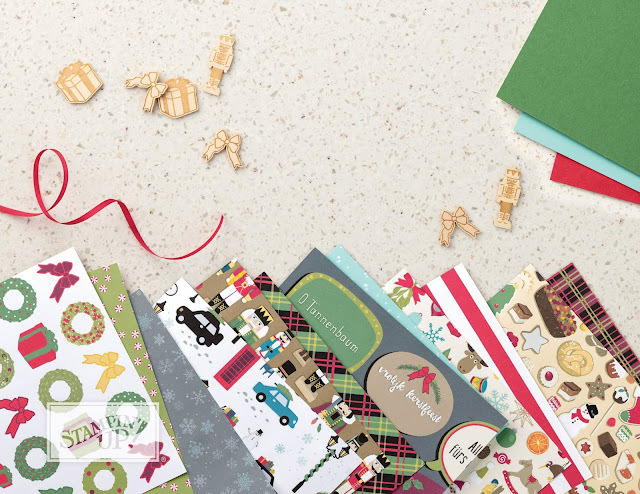 Use the hostess number below, then in October I will send you some christmas stampin'up goodies. One for the ladies today. Floral with a twist. 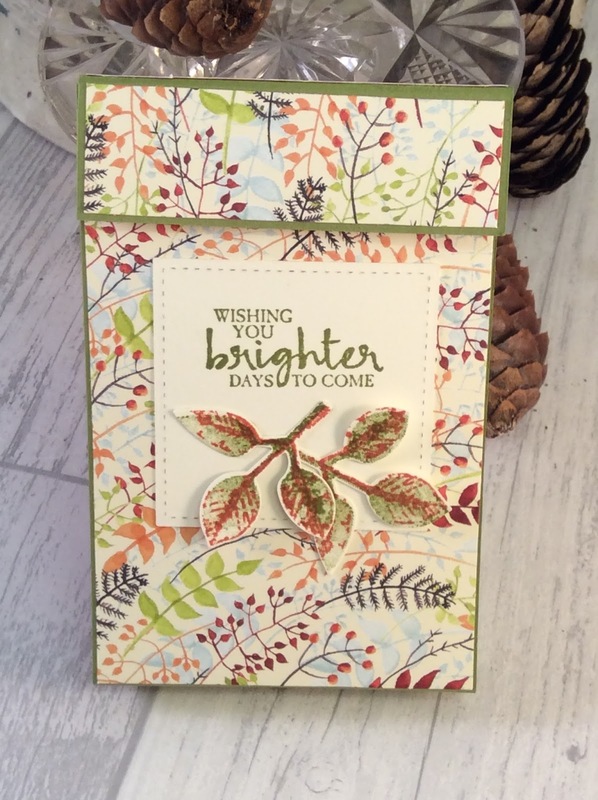 Again the flower is stamped on the shimmer white paper, water coloured then punched with the 2" circle punch. 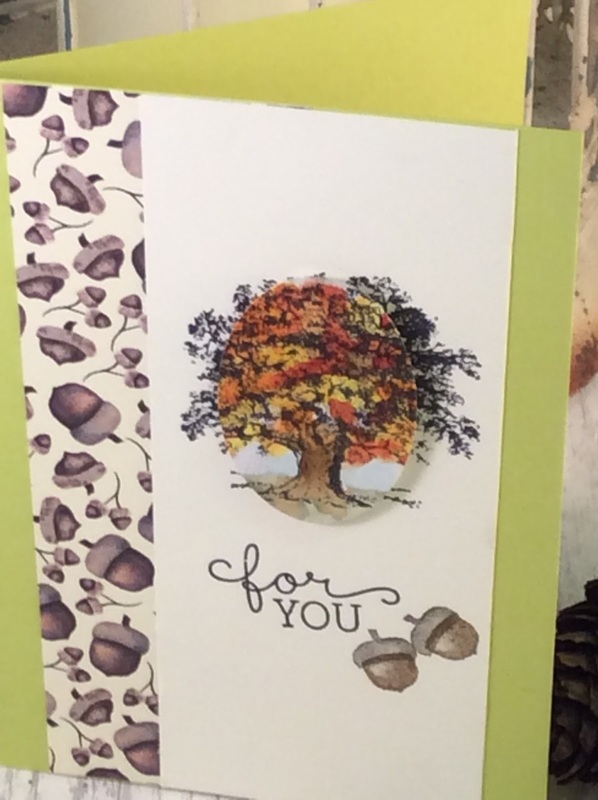 The card base is the Thick White card. This is a heavier weight card suitable for card bases. The little bow is one of the in colours, Berry Burst which matches the ink I used for the water-colouring. The stitching around the edge is a stamp from my stash. I suggest you get together with a friend pick out 4 different packs and spilt each one between you. That will give you 24sheets of 12 x 12 double sided paper for £15. Or 40 double sided sheets of 6 x 6 paper. Today I want to show you what I think are two of the prettiest papers. Firstly Delightful Daisy. All of these are pretty and so easy to use. And the second one is the Painted Autumn. This is in the new seasonal catalogue. Its a bit different to the daisy set in that the background colour is cream rather than white. This really appeals to me. This is a picture from the catalogue with items using the painted harvest set. Followed by three little cards I made as samples. I will list all the papers and their reference numbers for the online shop next Sunday when the special offer starts. For the session this week I have got the the aqua painters out, but I didn't want to paint a whole picture as time is quite short in the cafe. So this is what I came up with and I have to say I am very pleased with them both. The first one uses the 'lovely as a tree' stamp set. Its quite suitable for a man which I am often asked to create. The designer paper with the acorns on is from the 'Painted Autumn' set and the acorns themselves are stamps on the painted harvest set. 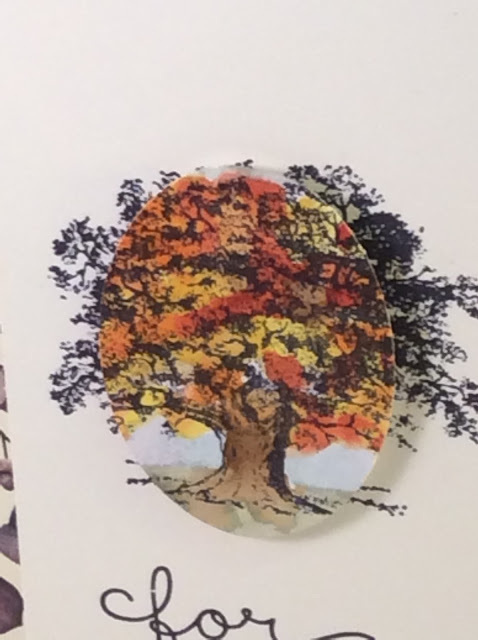 This close up shows how I have used the water-coloured part I painted the tree with a few autumnal colours then punched the oval shape out. 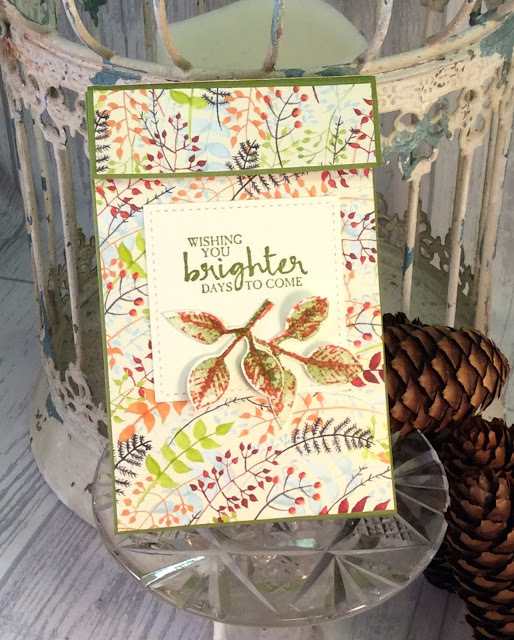 The water-colouring was done on the Stampin'Up shimmery white card. I was amazed just how much water this card would take. But the colouring worked a treat. I Stamped the tree onto whisper white and added the punched out oval on top with dimesionals so that it matched up. I think it is really effective. 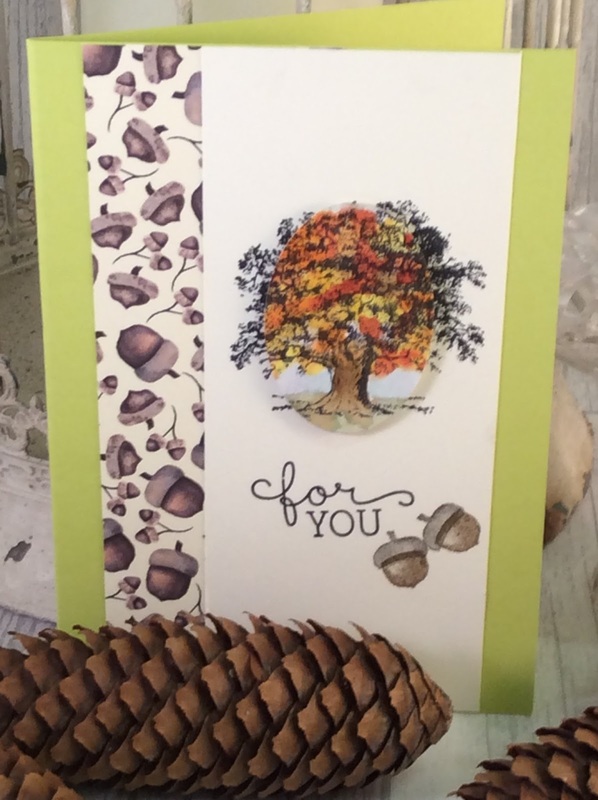 The acorns are from the Painted Harvest stamp set and the sentiment is from the Birthday Blooms set. I will show the second one tomorrow. One week today is the start of October and Stampin'Up have a special deal for the whole month. For every one who places an order in my online shop of over £35 during October I will send you half a pack of designer paper. you will be able to choose Christmas or Non Christmas during the first week of November. I'm going to kick off with the Christmas paper, Be Merry. I used these papers for my project class in 'Christmas in July' They are the traditional green and red and work well for lots of cards. 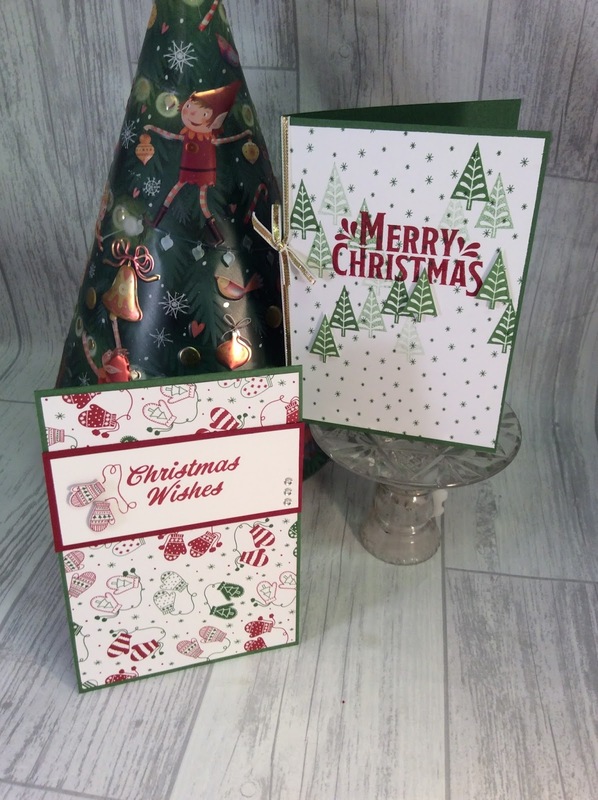 These are the cards we made and a picture of the paper from the catalogue. Can you match the cards up to the paper?